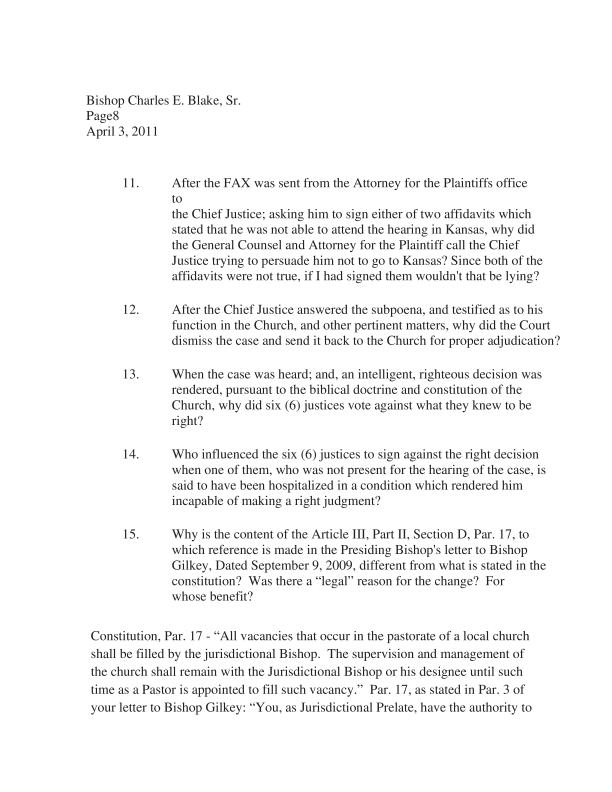 Anglican Church | IS THERE JUSTICE IN THE CHURCH OF GOD IN CHRIST? We members of the Body of Christ, have become so enamored with our leaders, we have contributed to their deception as many of them believe they are the reason ministries flourish. The shepherds now think they are the most important creatures in the sheep fold. Many of those who are members of the flock no longer like to be referred to as sheep because of the negative connotations associated with being sheep. Perhaps they view sheep as being dumb and weak. A member of the General Board has even referred to the people as “dumb sheep”. Sheep are not dumb, they know there is strength in numbers and they flee from danger. They know when they are separated from the rest of the flock they are vulnerable to predators. Both shepherds and the sheep have lost sight of the Chief Shepherd. The under shepherds have forgotten, it is not the shepherd who increases the number in the flock, sheep begat sheep. They only reproduce when they are protected, since running and banding together is their only form of defense. Some of those charged with protecting the flocks have become predators. They gnash at the sheep with their words, instead of leading they try to drive them. They use a few selected guard dogs to “keep the sheep in line” because the sheep are afraid of the dogs. They view them as a predator which is why they band together and run away. The shepherd experiences increase only when the sheep increase. A well fed, protected and healthy flock produces wool which the shepherd can gather, sell and then purchase things which benefit the shepherd. When sheep are protected, fed, healthy, and have their wounds healed they produce wool as well as increase their numbers which is how the shepherd experiences increase. 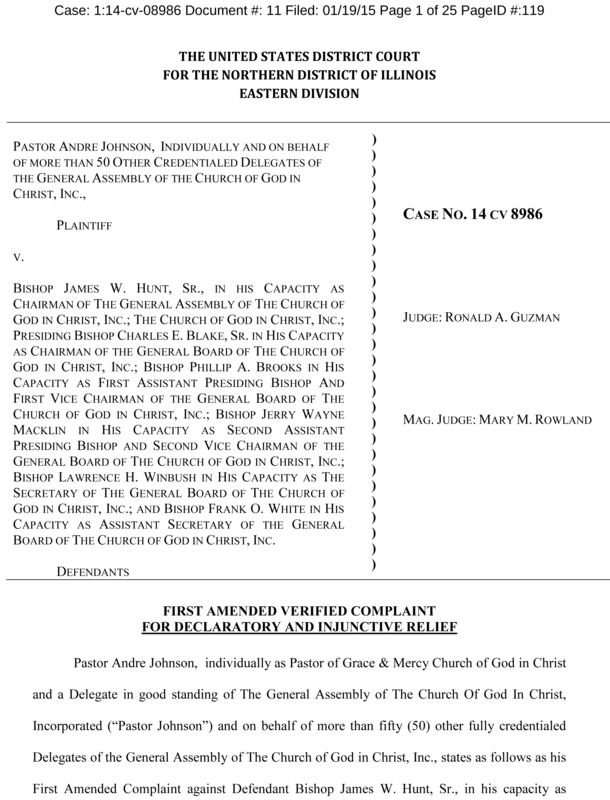 In a stunning display of the Love of Money, COGIC, Inc. has placed a lien against a local church; Greater First Church of God in Christ located in Knoxville, Tennessee. One might think how much money could a local church owe the National for them to place a lien against them? The answer is none; the local church went through the transfer process (which is why transfers were stopped by the General Board a violation) because they believe there is money to be gobbled up. There is now a new weapon in the leaderships insatiable appetite for money place a lien on the property and extort money form the local congregation. This is done under the “Trust Clause”. 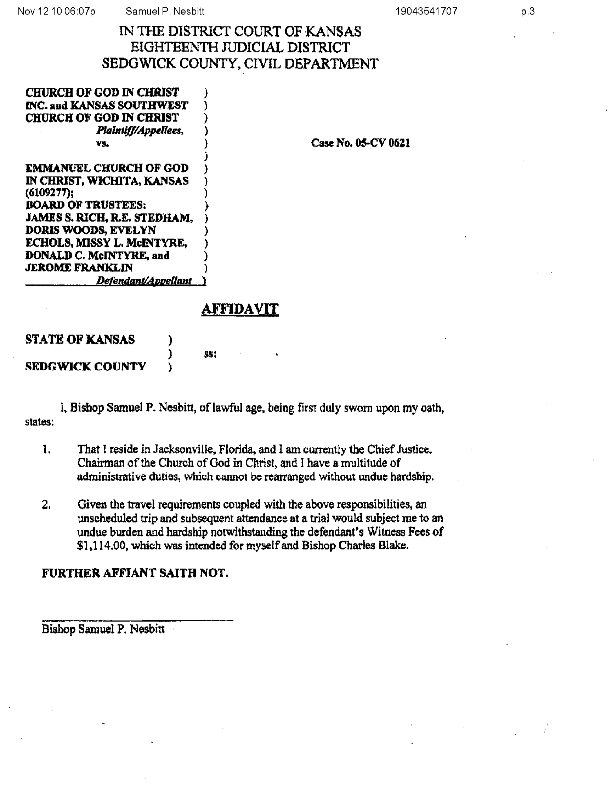 Another example of the need for the General Assembly to amend a clause which is noting more than a license to steal. The Federal Lawsuit has been revised to include members of the General Board. Those included are, the Presiding Bishop, first and second Assistant Presiding Bishop, the Secretary, and the Assistant Secretary of the General Board. When our leaders are more impressed with how many millions of dollars are managed or available. When our leaders seek material things and appear to believe wealth is the proof of the blessing of GOD. It puts the whole body on a pathway which leads to spiritual irrelevance. Do we really think we impress GOD? God has shown us what He requires, we appear to seek the wisdom of man instead of the wisdom of GOD. However we notice it does not say those who rule are worthy of double honour, but it says those who rule well are worthy. No matter how good our intentions are, apart from GOD all our plans will fail. The fact, that the things we are hearing of even exist among we who are called “saints” lets us know judgement has begun. We have to make a choice, just as in Jerimiah 6:16, shall we choose the good path, or shall we go our way. You can always tell when men rule well, they follow the Word of GOD. They esteem the Word of GOD above all else. GOD magnifies His Word above His Name. (Ps. 138:2) What value do we place on it? (21) “I hate, I despise your feast days, and I will not smell in your solemn assemblies. (22) “Though ye offer me burnt offerings and your meat offerings, I will not accept them: neither will I regard the peace offerings of your fat beasts. (23) “Take thou away from me the noise of thy songs; for I will not hear the melody of thy viols. (24) “But let judgment run down as waters, and righteousness as a mighty stream.”. Is our infamous “Cogic sound” an affront to GOD when we don’t follow His Word? Here is what GOD commissioned us to do, are we following His instructions? YOU CANNOT LEAD THE HOUSE OF GOD WITH THE WISDOM OF EGYPT. This decision has the foreseeable possibility of requiring the National Church to purchase liability, fire, and all insurances required for a corporation on each local Church in every state of the union. Since the local people are not the owners the owner is the, Church of God in Christ, Inc., the only entity required to purchase insurance. As the owner, they now have liability for every crack in every sidewalk on COGIC property all across America. As the owner, they are now responsible for every chicken dinner at every COGIC in America. 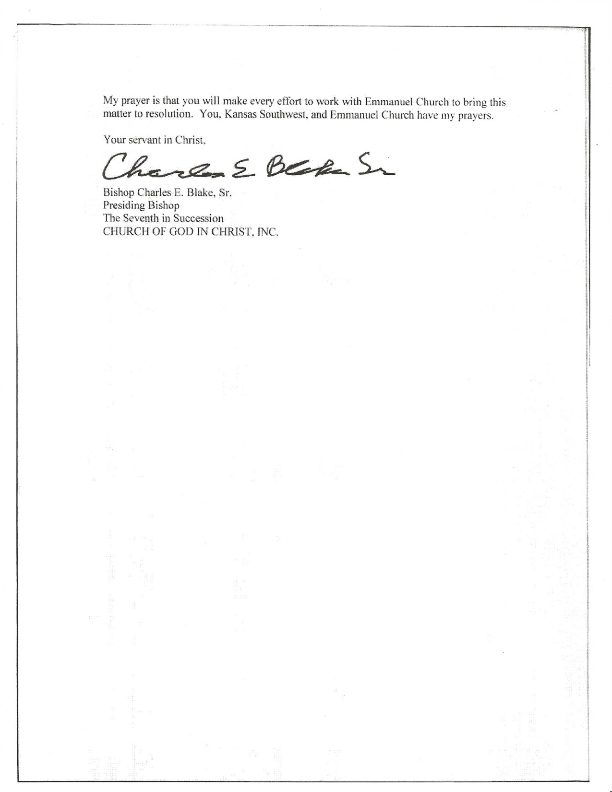 These are some of the thorns, in the bouquet of roses the General Board, Bishop Gilkey, and the General Counsel picked when they sued the remaining charter members of Emmanuel Church of God in Christ, Wichita, Kansas. 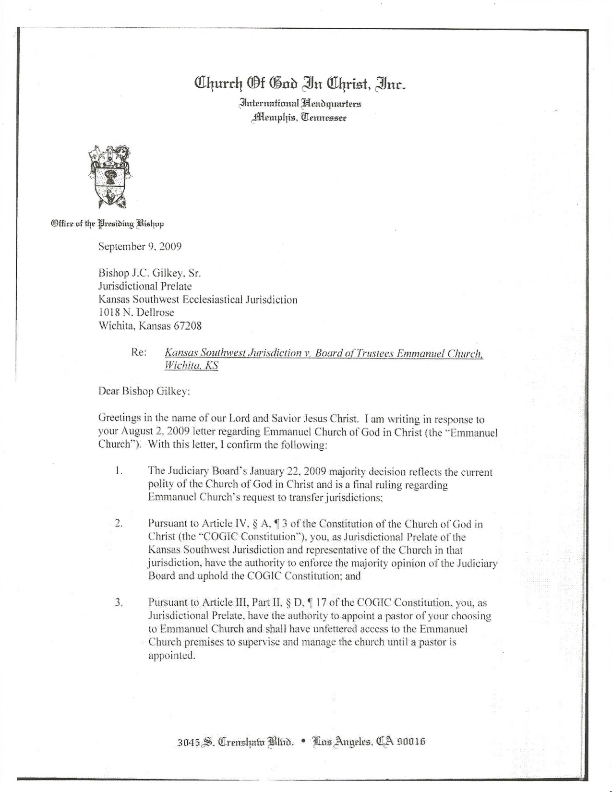 The Church of God in Christ Constitution requires the National Board of Trustees to “preserve, protect, and maintain all property of the church, not otherwise provided for.” This now includes all local churches. Do insurance companies know who they have insured? They think it is the local church, how many insurance policies could be canceled or not honored because of this? TO THE GENERAL ASSEMBLY: IS THERE DECEIT IN THE HOUSE? What do you call a farmer who clears the ground, plows the field, plants the seed, kills the weeds, and reaps the harvest. He then loads the grain and takes it to the mill. After receiving the going rate he walks out of the office with the fruit of his labor. 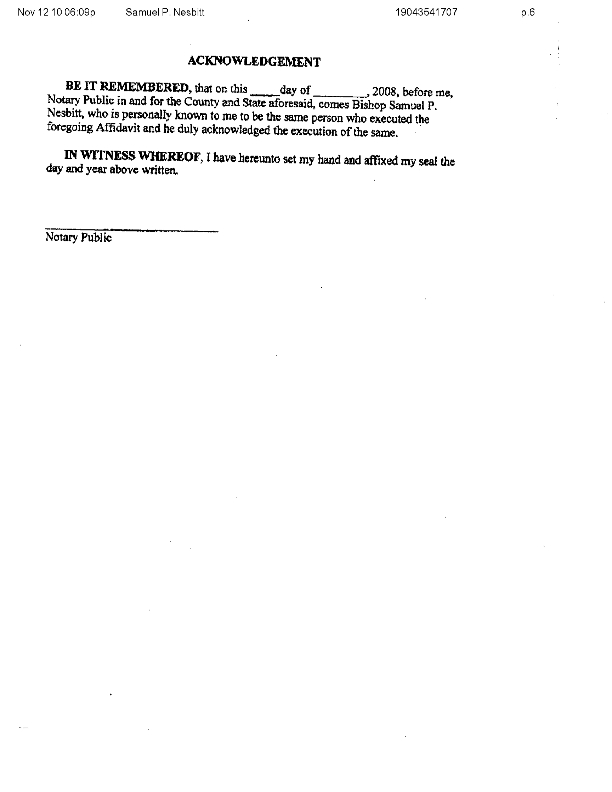 However the person who owns the land is there to claim his agreed upon share. That farmer is a sharecropper. When the sharecropper dies, the landowner, as the legal owner can do whatever he wants, he owns the land. There are similarities between sharecropper and the COGIC Pastor and members. The farmer has one advantage over the Pastors and members of the Church of God in Christ, he knows he is a sharecropper. The COGIC Pastor and members do not!! Don’t Be Deceived. ANY!!! LAND TRUST, IN THE NAME OF THE NATIONAL CHURCH, IMPLIED OR EXPRESSED MAKES YOU A SHARECROPPER. 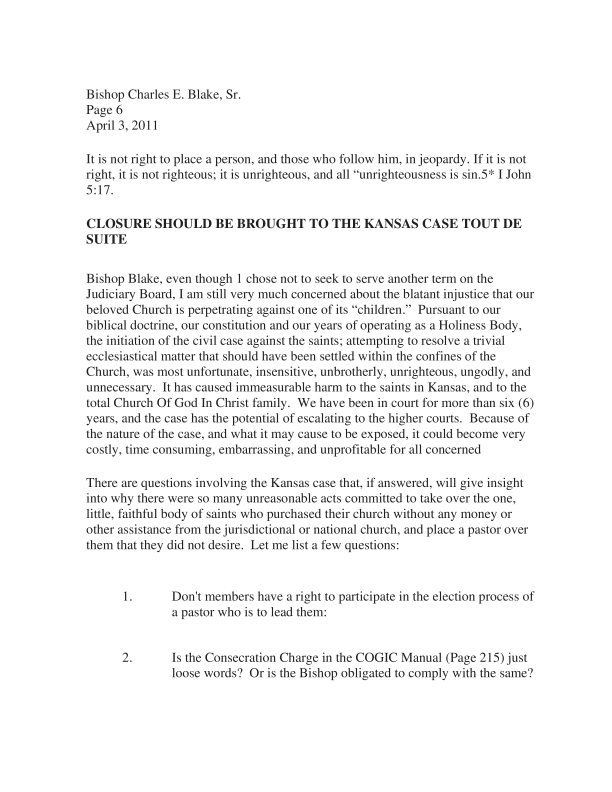 That is double talk and legal speak; in the Emmanuel COGIC , Wichita, Kansas case, the local church was taken from the local members who bought and paid for the land, constructed the building, maintained the Church all with no national or state monies, without a transfer of title. The local members were barred from ever holding any office and were effectively ousted as member. Just as the King of Assyria in 2 Kings 17:24 removed the people and brought in others. The original members were displaced. AND THE GENERAL COUNSEL HELPED. THANKS TO BISHOP GILKEY, THE GENERAL COUNSEL, AND THE GENERAL BOARD, WE ARE ALL SHARECROPPERS, the national owns all the churches”. The General Counsel knows what an “Express Trust” is (See page 1176, column 1,paragraph “P-Q”). 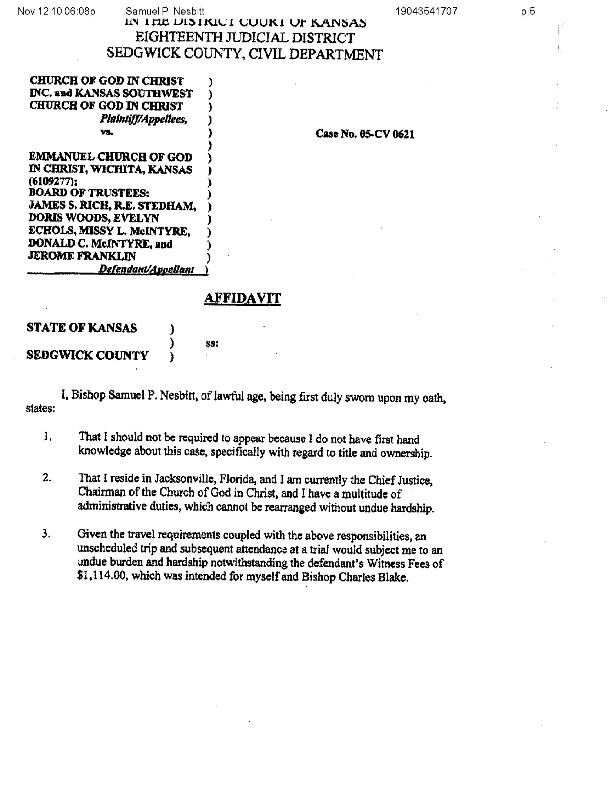 He knows the words, “Express Trust” wipes out the part about “title to the property would belong to the local church”. It sounds good but you would still be a sharecropper! The difference in an “Implied Trust” and an “Express Trust” is the express trust is done in writing and the Implied Trust (page 1176 column 1, paragraph “S”)is one implied or presumed by circumstances. 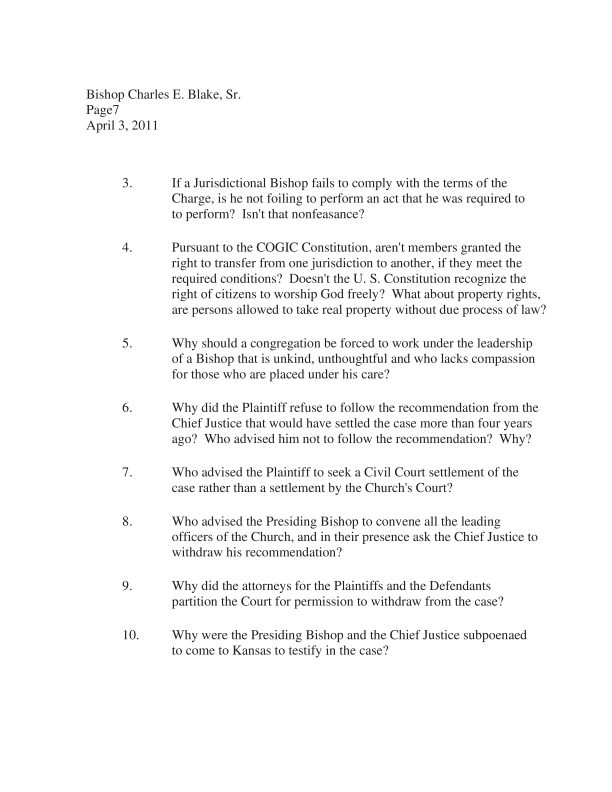 The circumstances; since the “civil court” finds (believes) the Church of God in Christ is “hierarchical”, the civil court presumes the National Church owns all the property, to quote Bishop Enoch Perry III “akin to the Catholic Church” (2009 CV 3960; pg 129, line 25, pg. 130 line 1). We must understand we are at a disadvantage when we,talk to people with legal training who often use words unfamiliar to us. Words may have a different meaning to the layman than they have in a court of law. 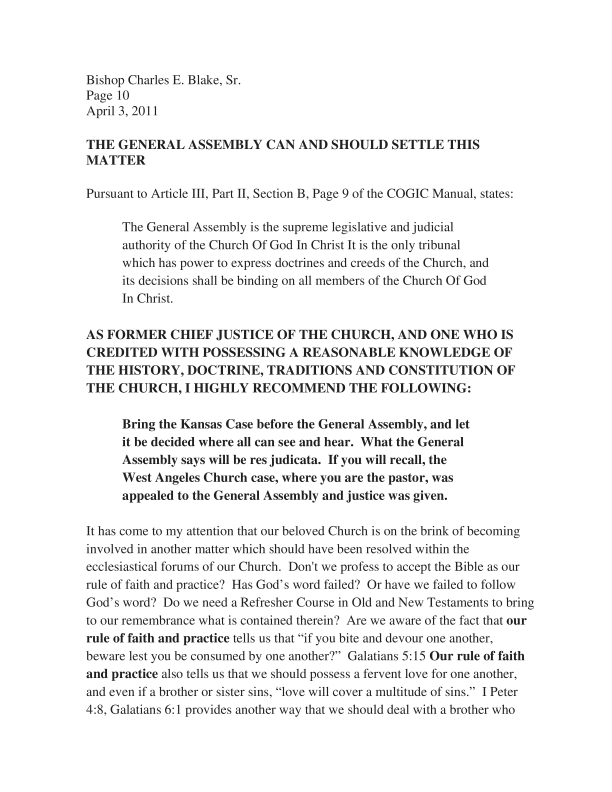 The General Assembly must decide if it will condone the National Church, taking property when it has put nothing into it. No one knowingly agrees to be plundered and beaten, in Jesus name. 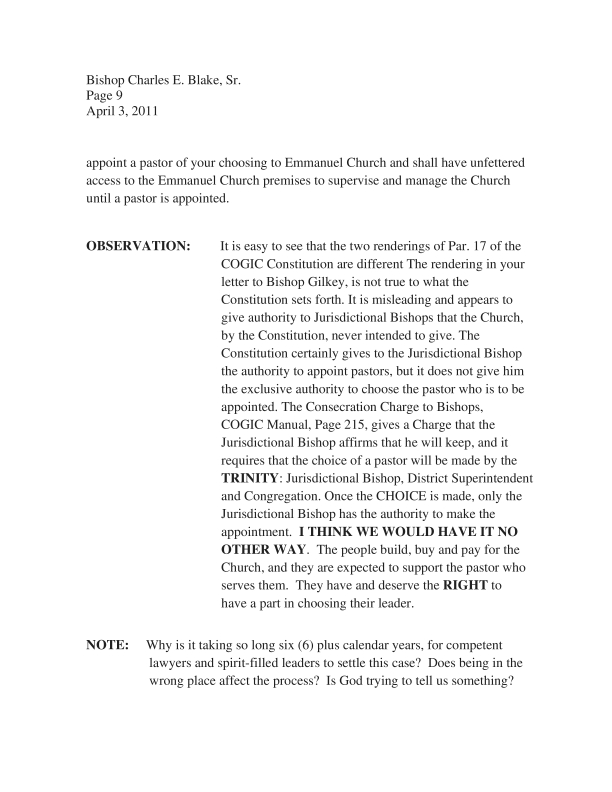 If the local church belongs to the local members, the property must be held in Trust for the Local Members exclusively. 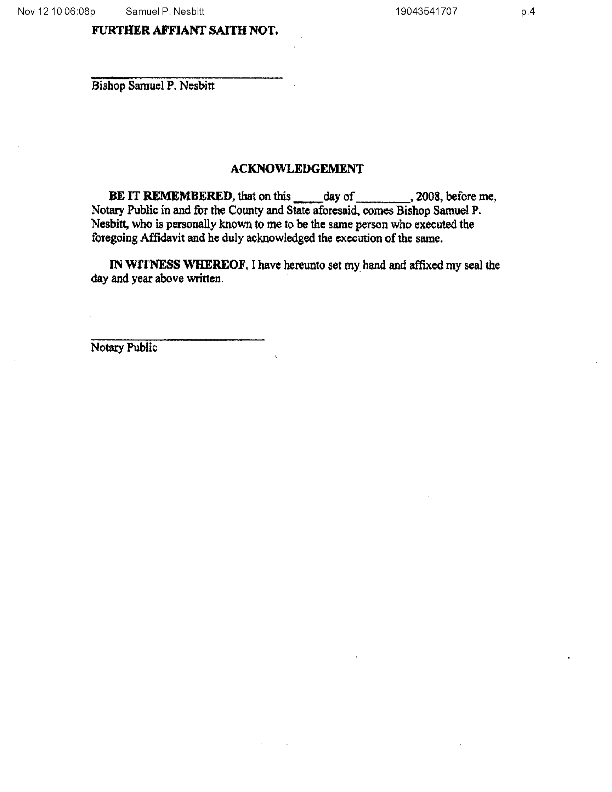 That the local church as grantee as named on the deed, is the exclusive owner of the local church property. Property acquired by gift or device must create to the local church the same right of exclusive ownership as purchased property. The local church shall have the right to defend its right of ownership against any and all others.